Crust: Preheat oven to 350°F. Stir together crushed crackers and brown sugar; toss with melted butter. Press into bottom of 24 mini muffin cups lined with paper liners. Bake for 8 to 10 minutes or until golden brown and set. Let cool completely. Filling: Using electric mixer, beat together cream cheese, sugar and honey until smooth. 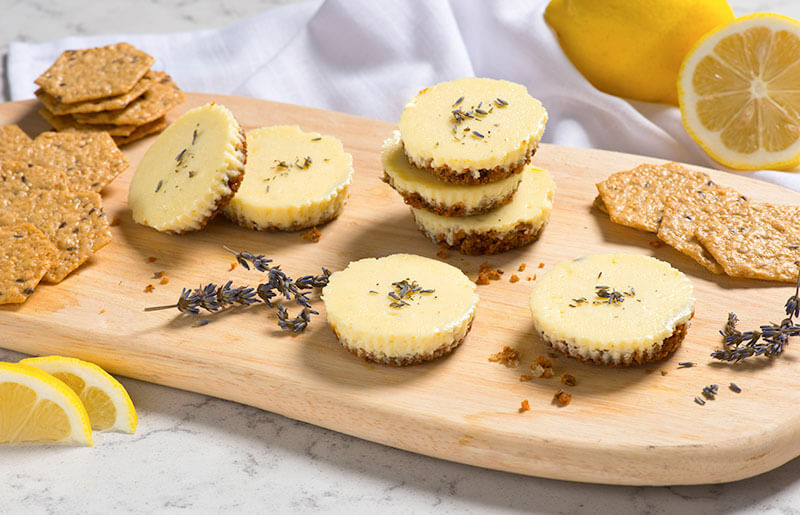 Rub lavender between fingers; beat into cream cheese mixture along with lemon zest, lemon juice and vanilla. Beat in egg just until blended. Spoon evenly into muffin cups. Reduce oven temperature to 325°F. Bake for 18 to 20 minutes or until just set. Let cool to room temperature in pan on rack. Refrigerate for at least 6 hours or overnight. Tip: Garnish with additional lavender and candied lemon if desired.